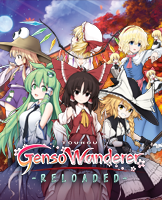 Touhou Genso Wanderer Reloaded | NIS America, Inc.
Touhou Genso Wanderer Reloaded is the definitive edition of Touhou Genso Wanderer, a game featuring adorable and memorable Touhou characters. It returns with the original story, all its DLC, and a load of brand-new content featuring new characters and scenarios. Relive the complete journey through the Tower of Desire and embark on all-new adventures beyond your wildest imaginations! Become an unstoppable duo as you and your partner fight against evil and cast powerful bullet-hell spells! Craft items, upgrade weapons, take a break with other Touhou girls at the cafe... Enjoy the story and solve its mysteries at your own pace!